Today we announced that AIG has proposed to acquire Validus. This is an exciting announcement for both companies, and for us personally. For AIG, this is a great step forward in our strategy to grow the company to be a global, profitable leader in the industry. The transaction will bring new businesses and capabilities to AIG’s General Insurance franchise, while expanding our bench of talent and deepening our underwriting expertise. For Validus, the transaction is a source of pride and shows the value the founders and management team have built since 2005. Our employees will benefit from the growth opportunities that will come from access to AIG’s global scale and balance sheet. And together, we will be able to serve our brokers and clients in new and exciting ways. And Bermuda is at the center of it all. Once again, it has proven itself to be a key leader of the global insurance and reinsurance industry. 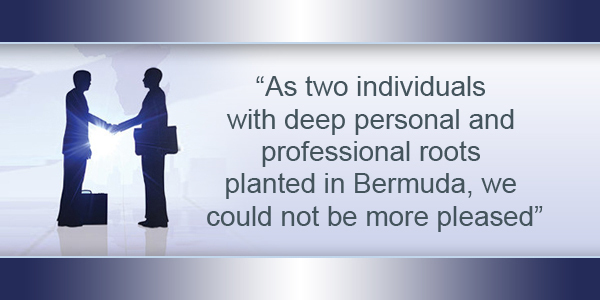 As two individuals with deep personal and professional roots planted in Bermuda, we could not be more pleased. Because our companies are highly complementary, after closing we expect there to be minimal integration and that Validus will operate largely as it does today but within General Insurance at AIG. Clients and brokers can expect the same responsive, solutions-driven approach to which they are accustomed. And, at AIG, we look forward to being more closely connected to Bermuda once again through Validus’ strong presence here. When C.V. Starr, the founder of the insurance group that became AIG, was looking for a base for his international business operations outside the United States, he chose Bermuda and opened an office in December 1947. The genesis of the Island’s international business financial services sector can be traced to this point. In fact, the two companies Starr established mirror the very diversity that the AIG/Validus consolidation represents: they handled the general business, life insurance companies in the Far East, real estate investments, and professional reinsurance for other AIG companies and for third party risks. As much as we value its industry heritage, it is Bermuda’s innovative insurance culture that will make it a winning marketplace as the needs of clients and brokers evolve. Meanwhile, Validus’ proprietary cat modeling abilities are another example of how technology can deliver sustainable competitive advantage. AIG and Validus have known and admired each other for some time and have tremendous respect for each other’s work. We are confident that Validus will thrive within AIG, and that AIG will thrive in Bermuda. 13 Dec: Column: Should OTs Vote In UK Parliament? 04 Dec: Column: Why Just Gibraltar At Conference? 02 Nov: Carla Seely Column: Are You A Risk Taker? Wonderful communication effort given by these gentlemen within an environment of tension around M&A within the insurance sector in Bermuda as it relates to real and potential job loss- direct and collateral, charitable dollar loss etc. I’ve no idea what that means, but I do know it’s good for Bermuda bigger picture (a giant like AIG backing a Bermuda heavy Reinsurer). But not so good if you work at Validus in a non-underwriting role.